"These are things we need to do, and we've decided to do them." Gathering around a table at The Talk House, an old haunt, a group of friends and theatre artists reunite after ten years to reminisce and catch-up on each other’s lives. At first, the conversation is fairly run-of-the-mill: current TV shows and where their careers have taken them. Eventually, the discussion’s tone takes a turn when they mention supplementing their incomes through the government-led program to enlist unemployed artists for drone strikes and carrying out violent attacks on foreign land. 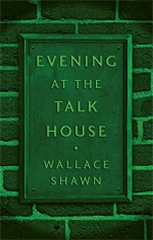 As is typical of Shawn’s plays, the premise of Evening at the Talk House at once amuses and unsettles, forcing the viewer to wonder whether being too idle makes all of us complicit in the world’s ongoing destruction. <?xml:namespace prefix = "o" ns = "urn:schemas-microsoft-com:office:office" />Wallace Shawn is a noted actor and writer. His often politically charged and controversial plays include The Fever, Aunt Dan and Lemon, Marie and Bruce, and The Designated Mourner. With Andre´ Gregory, he co-wrote My Dinner with Andre´, in which he also starred. He adapted the classic Ibsen play A Master Builder for film.